You wouldn’t think luxury and green belong in the same sentence together but I’ll give it a go. Having a swimming pool in your own backyard is a luxury, while heating it with a solar panel heating system makes it green. In this context, green does not mean algae-laden. Okay…so it’s a bit of a stretch but it’s a better ecological choice than heating it with natural gas or even a heat pump. After the initial installation costs of the solar pool heating system, the ongoing cost to heat this pool will be negligible. The only ongoing cost will be electricity to run the control panel, recirculating pump and periodic maintenance. In my opinion, heating the pool with the energy of the sun’s rays vs heating with a natural gas system would be considered green. Agreed? Owning a swimming pool is indeed a luxury and lengthening the swimming season by heating your pool is one way to take advantage of the cooler months while still enjoying one of the biggest investments on your property. So who are these tree huggers that have decided to do the unthinkable by going green with a home feature that seems out of place in the green world? As I write this, I’m shaking my head. Why? Because these tree huggers are my parents. That’s right…Mom & Dad. Alright…so having a swimming pool heated by pure solar energy doesn’t exactly make them certified tree huggers. The solar energy part of the equation does but the swimming pool part isn’t exactly a green feature for any home. The most surprising thing about this solar pool heater they had installed is the fact that they even thought to go green for something like this. And for this, I am very, very proud of them! Whodathunkit? Ma & Pa Kettle (as we like to call them sometimes) with a fancy, state-of-the-art solar pool heating system. Apparently, I don’t give them as much credit as I should. I never know what they’ll do next! Now This Is A Green Swimming Pool If Ever There Was One! In their defense, it’s about as green, or eco-friendly, of a pool as you’re going to find. For starters, the pool is filled with well water. Also, they’ve got a saltwater pool. Chlorine tabs are never added to this pool and shocking it is an occasional affair. Dad adds salt pellets directly into the pool as needed and the ionizer converts it to natural chlorine. It’s a beautiful thing and a huge money-saver! I’ll save all of that for another post, or two, later on down the proverbial road. Back to the solar pool heating system they had installed recently. It was a professional installation and for good reason. Besides just having the system installed, a few special adjustments were required for this particular installation. The system could possibly have been installed with the existing service panel/plugs but my parental units wanted to upgrade the panels in the shed and house to avoid electrical fires. Smart move! This required them to bury the new high voltage lines underground in metal conduit. The original builder hooked up power to the shed according to code back in the day and that doesn’t get it nowadays. Anyway, that was a huge part of the expense of the job while not wholly unrelated. How Does The Solar Pool Heating System Work? This particular solar pool heating system is controlled by Goldline Controls and it is normally installed using mostly copper pipes and some PVC fittings. They had to skip on the copper and make it all PVC. Why? Because their pool converts salt to chlorine. Salt and copper DO NOT get along. The brains of the system is the solar pool control panel. It’s got a nifty little valve actuator that automatically rotates the 3-port valve between the filter, the solar collectors and the salt converter, as required by the system controller. Very slick. The ten (4′ x 12′) solar energy collection panels were installed on the roof of the shed (it’s a rather large shed). These aren’t anything like electrical solar panels. Water is pumped up to the roof and “filtered” down through all of the internal grooves inside of the hard plastic panels where it is heated by the sun’s rays and then returned back to the pool. The system has automatic freeze protection for winter months and nocturnal cooling capabilities for cooling it down a few degrees in the summer months. 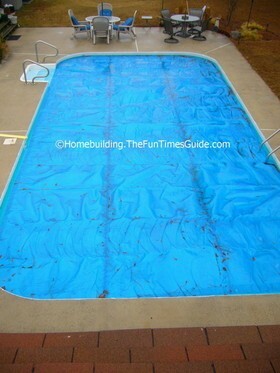 They also purchased an 18′ x 36′ thermal blanket to spread out on top of the pool to keep it warm when not in use. It looks and feels like bubble wrap except thicker and stiffer. How Long Did It Take To Install The Solar Pool Heating System? This system took 2 days to install including the additional electrical work. All of the installation and electrical work was performed by My Electrician. Since it was installed last November, the pipes have sprung a couple of leaks up on the roof that the installers are attributing to “bracket failure”. Hopefully, they’ve got the bugs worked out by now and are set for awhile. The system was installed just a little too far into winter for it to get really warm and stay warm. With any luck they’ll get it going in early Spring just in time for our visit during the Steeplechase in March. Crank it up! Special thanks to my parents for remembering to take some of these photos during the installation. A consumer’s guide to solar swimming pool heaters provided as a public service by the U.S. Department of Energy: A must read! Solar pool heaters explained along with a self-proclaimed improvement over all other systems.